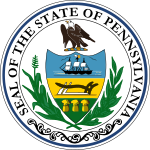 The 2020 United States House of Representatives elections in Pennsylvania will be held on November 3, 2020, to elect the 18 U.S. Representatives from the state of Pennsylvania, one from each of the state's 18 congressional districts. The elections will coincide with the 2020 U.S. presidential election, as well as other elections to the House of Representatives, elections to the United States Senate and various state and local elections. The 1st district consists of all of Bucks County and a sliver of Montgomery County. The incumbent is Republican Brian Fitzpatrick, who was re-elected with 51.3% of the vote in 2018. The 7th district is based in the Lehigh Valley, and consists of Lehigh and Northampton counties as well as parts of Monroe County, including the cities of Allentown, Bethlehem, and Easton. The incumbent is Democrat Susan Wild, who flipped the district and was elected with 53.5% of the vote in 2018. The 10th district covers all of Dauphin County and parts of Cumberland and York counties, including the cities of Harrisburg and York. The incumbent is Republican Scott Perry, who was re-elected with 51.3% of the vote in 2018. The 18th district includes the entire city of Pittsburgh and parts of surrounding suburbs. The incumbent is Democrat Mike Doyle, who was re-elected unopposed in 2018. ^ a b c d Wasserman, David; Flinn, Ally (November 7, 2018). "2018 House Popular Vote Tracker". Cook Political Report. Retrieved February 15, 2019. ^ Wasserman, David (March 1, 2019). "2020 House Overview: Can Democrats Keep Their Majority?". Cook Political Report. Retrieved March 1, 2019. ^ Olson, Laura (January 3, 2019). "Dean Browning files paperwork to run for Congress in 2020". The Morning Call. Retrieved February 15, 2019. ^ Cole, John (April 11, 2019). "Brier Announces Bid For PA10". Politics PA. Retrieved April 11, 2019. ^ Clearfield, Alex [@AlexClearfield] (March 26, 2019). "SCOOP: Per three sources, Pennsylvania state Auditor General Eugene DePasquale (D) is strongly considering challenging Rep. Scott Perry (R) in #PA10. DePasquale, who passed on a run in 2018, had previously been thought to be waiting for a statewide run in 2022" (Tweet). Retrieved March 26, 2019 – via Twitter. ^ Clearfield, Alex [@AlexClearfield] (January 24, 2019). "Scooplet in #PA10: Per multiple sources in the district, 2018 Democratic nominee George Scott is considering running again. He lost narrowly to Republican Scott Perry in a new district based around Harrisburg" (Tweet). Retrieved February 15, 2019 – via Twitter. ^ Shoemaker, J. Dale (April 10, 2019). "Pitt law professor Gerald S. Dickinson to challenge U.S. Rep. Mike Doyle in 2020". Public Source. Retrieved April 14, 2019.